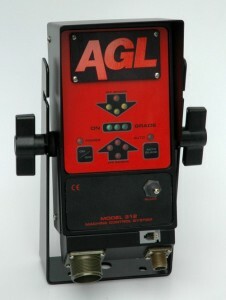 AGL Machine Control - Rust Sales Inc.Rust Sales Inc.
AGL Machine Control Systems allow the user to obtain better jobsite control by using a plane of laser light to ensure the proper elevation of their equipment. Product is for the customer involved in construction or agricultural projects such as site preparation, dam construction, and excavation projects. Customers use rotating lasers plus a detector system mounted on equipment to constantly receive the laser reference plane. Some systems are interfaced with an electric/hydraulic valve into the machine’s hydraulic system to provide automatic control of the blade elevation.